Those countries which you now think of as closed will soon be open. And those countries you now think of as most open will soon be closed. 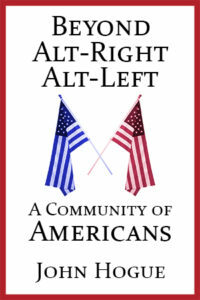 Click on the cover and check out John Hogue’s newest and most topical book! Sturé Johansson, who channeled the spirit “Ambres” is known as the Swedish Edgar Cayce for similarly going into trance to help heal people and from time to time foresee the future. I became aware of him as many Americans did through actress Shirley MacLaine introducing his work in her breakout New Age, autobiographical book Out on a Limb. This prophecy from Ambres was recorded at the time the Soviet Union in its final years of existence was opening up to Premier Mikhail Gorbachev’s Glasnost and Perestroika reform movements. Once the Cold War concluded by the end of the 1980s (as I forecast it would in my first book Nostradamus and the Millennium), the future would watch Russia become more open and free in the passing decades, while the victor of the Cold War, the United States, began to close down and become more totalitarian and fascist. On Monday RT America, the American news bureau of RT (Russia Today, was forced to comply with the US Justice Department’s ultimatum to register as a “Foreign Agent” or face an immediate freezing of all its bank accounts. No reasons were given. It may be the first step fulfilling a forecast I already outlined last year to insert into my upcoming biannual book of world prophecies, Predictions 2018-2019: Years of Crisis and Breakthrough. A year ago, I foresaw the potential that the last real news network on television would have its plug pulled by the US government in 2018. It could happen because Ambres is presciently correct. The DOJ’s action, unsubstantiated by fact, is far less American and far more like how I remember communist censorship of critical, fact-based and sourced news reaching inside Soviet Russia. In my work with current events and how they trend in prophecy, I take care and time to vet my news sources. You get to know how good they are by double-checking their sources and measuring the accuracy of their reports against the judge of time and actual events. I’ve been vetting RT International and RT America for over four years and counting and have found them to be the last network on television to perform a fair and balanced public service. They present all sides of an issue, and question power and authority in Washington. RT does what US news media used to do when I was growing up in California in a more open America. Clamping and inhibiting RT America on Monday as a foreign agent (read “enemy” agent) is the kind of thing Soviet bureaucrats would do. The Justice Department singled out an open and critical news source. They were motivated by ideology and politics rather than a presentation off acts. The DOJ rides a growing hysteria not seen in the nation since the dark days of McCarthyism. They have become the legal enabler of what has been a witch hunt overtaking the American media, letting fly a strident but unproven paranoia to scapegoat all things “Russian” as solely responsible for the nation’s woes. Is this not very Soviet communist behavior? Consider what happened to anyone critical of the Kremlin in the USSR era. Soon they’d be singled out and purged as an “American” sympathizer, a fifth columnist, an American spy, part of an American propaganda organ, and so on. The last time United States fell under the hysteria of unfounded conspiracies pinned on Russians was during US Senator Joseph McCarthy’s attempt in the late 1940s and early 1950s to silence and purge liberal Hollywood actors, authors, and scriptwriters. 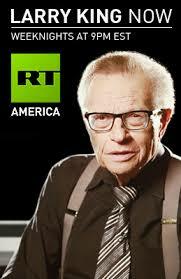 He even implicated scions of journalism like Edward R. Murrow a communist Russian propaganda bullhorn. McCarthy’s reign of terror destroyed people’s lives, harmed free speech and expression in America. At the same time in Soviet Russia, Stalin was purging writers, artists and publicly shaming composers of the stature of Khachaturian, Shostakovich and Prokofiev as bourgeois enemies of the state. Before he died of a stroke, Stalin in his notorious predilection to act on his deadly habits of paranoia was preparing for another purge to rival the Red Terror of the late 1930s that murdered a million Soviet citizens and sent millions more to labor camps in Siberia. This time the main targets of his unproven and hysterical blame game for all things not working properly in his “worker’s paradise” were going to be Soviet Jews. Of course these traitors must be agents of American propaganda trying to undermine the Soviet Union. Everything I’m seeing now going on in the United States media reminds me less of the America I grew up in and more like the Soviet Union, even down to the jargon. Like the Soviet Union, our mainstream media is coopted and controlled not by communists but by corporate interests overtaking our government. America is now governed under an elitist oligarchic system, a variation of the Stalinist system of a communist-ruling apparatchik class. I see a corporate dictatorship gathering strength that in the name of freedom is anything but. RT America has become just as threatening to the US-corporately controlled government in our time as Voice of America was to Stalin’s communist regime. 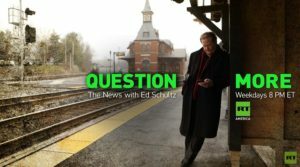 V of O didn’t need to propagate lies, they just broadcast on radio into the Soviet Union the critical truth about what wasn’t working in the so-called “worker’s paradise.” RT America, in my direct vetting and experience of them has become a new Voice of America directed at Americans. They tell you what isn’t working; they bring a healthy breath of critical stories you no longer get in the US mainstream news. They are a source of alternative points of view, without which a democratic citizenry cannot long sustain its freedom. Our founding fathers of the Republic cautioned us, and even wrote it into the US Constitution, that a free press is absolutely needed. The government—not the people—must be ever watched and questioned as a critical element to this Republic sustaining its freedoms. The powerful should ever be afraid of the people—not the other way around. The other way around is Tyranny. 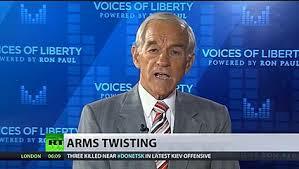 What happened to RT America was an act of governmental tyranny. Like Voice of America did for oppressed Soviet citizens, RT International and RT America show you the real world beyond the US media’s generally uncritical narrative bubble. I’ve lived extensively outside of the country in developing nations. The red-white and blue light of American isolationism does not blind me. If you’re still reading Hogueprophecy all these years, you are enjoying a more enlightened American and refreshing worldview at my website and in my books. I try to inform you how America affects its future. To do that, I give you the unvarnished views of the world about us as “U.S.” In my over six decades and counting of life, I’ve never seen the American collective mindset stray so far from reality from government’s top leaders to the media and all the way down to a new low of news literacy of the American public. This country is becoming the world’s biggest problem rather than its greatest hope. Truth is only a traitor to politicians in Washington who live, eat, breathe and foment “the big lie” like Russians being responsible for all this nation’s problems, just like Jews were held responsible in Nazi Germany for all of its faults. Soviet citizens got the same enlightenment about the world outside of their communist-narrative bubble from Voice of America and like RT, the communists also clamped down on anyone in the US press working in the Soviet Union, branding them similarly as enemy “foreign agents” subject to censorship or being kicked out of the country at a moment’s notice. The Department of Justice is playing politics, nothing more. They have acted upon the political pressure from US Senate and Congressional hearings into so-called Russian meddling and RT that, by the way, had crowds of people called to testify but not one single RT America news reporter, producer or news anchor—past or present—was summoned to testify under oath before Congress in RT’s defense. Many of these openly demanded to stand before Congress and testify in the name of the First Amendment and give their evidence under oath. What was Congress afraid of? Do you see the DOJ calling upon BBC America to register as a foreign agent or else? Did the DOJ threaten Al-Jazeera (Qatar), Deutsche Welle (Germany), or CCTV (People’s Republic of “red” China)? Why not? Aren’t these news networks owned and financed by their foreign “agents” in London, Doha, Berlin or Beijing governments to propagate a world view according to their perspective in, and about, America? This current US government doesn’t want you to be informed any more than Stalin did. All the mantras of RT being a “propaganda bullhorn” are a big lie repeated for hypnotic effect. The public “dumb”-beat commenced with Obama’s Secretary of State, John Kerry back in 2013. Failed presidential candidate Hillary Clinton took up loudly beating the “dumb” in 2017, blaming her mediocrity as a campaigner on “Russian hacks” and the Russians influencing the US elections in the favor of Trump. McClintonism in the present echoes McCarthyism of the past, a mob-inciting mindset, running high on emotionally charged hearsay from “undisclosed sources” that don’t bring out into the light any solid, sourced and objective EVIDENCE. You want to see the evidence? RT provides both sides. Case in point. The other day, RT America showed recordings of CNN and MSNBC implicating RT as the “only” news network showing footage of Hillary Clinton last year on 11 September ceremonies, ill and fainting when escorted to her waiting SUV. They presented this as solid proof that RT was trying to influence the US elections, talking up the concerns of Clinton’s potential health issues to scare voters away. RT then did what journalists used to do in this country, they presented the video evidence of those accusations openly and followed them up with archival footage from CNN and MSNBC, plus ABC, NBC and CBS recorded at the same time in September 2016. The footage clearly revealed ALL of those networks giving EXACTLY the same attention if not more than RT. They broadcast and rebroadcast the same videos of Hillary fainting. CNN gathered its army of talking heads to speculate and debate for days whether Clinton was hiding a health problem that if exposed could make her unelectable. That’s the RT America I have experience for years—both sides presented, with facts, with sources mentioned and not “unidentified” sources or hearsay as news. What else can you call the recent and revisionist reports by CNN and MSNBC but a bald-faced lie to support a witch-hunt without evidence? Even yesterday CNN was peddling a story that Russia was responsible for the Catalonia vote for independence that even the Prime Minister of Spain said that he had no evidence to support the story. RT America is your LAST journalistic “Voice” in America, but don’t believe or disbelieve me. Don’t react blindly. Think. Reason. Step out of your Russian hysteria straightjacket for a moment. Turn on your televisions—while you still can—and spend whatever time is left for RT America and watch it. Gain a context to what your government is about to do to you. What they’re doing to RT America is a test. 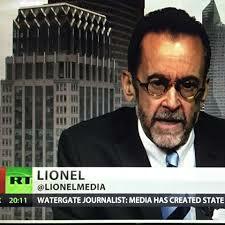 If successful your domestically based news networks will be completely suppressed. CNN? MSNBC? FOX? CBS? NBC? ABC? Rachel “Madcow”? 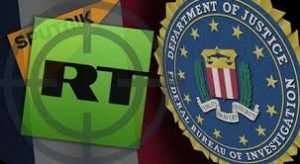 If you have an open mind, I am certain you’ll find out why the US government wants to silence RT. It’s real news. It’s critical of Russia and Putin as it is of Washington. It’s anchored by American journalists, voices the mainstream news no longer allows to give you straight talk. 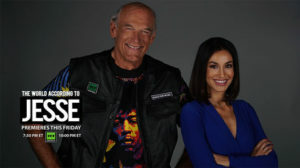 It is no wonder RT America is becoming very popular with the fastest growing news viewership on television, YouTube and Facebook while the mainstream news is bleeding away ratings to it. Americans are starving for real news about their country and the world, especially the younger generations. Question more, question power, and question what your government and the real hacks out there, your American mainstream media! Is Russia getting more open and the US getting more like the Soviet Union after the last Cold War? I remember how the Soviet news networks just read their Foreign Ministry communiqués without putting them into any critical question just like US news networks are doing today. Question more. Question everything with a skeptical inquiry using that word Skepticism as it was originally intended: to investigate without prejudice for or against RT America before the prophecy of Ambres is completely fulfilled and your soon to become undemocratic government pulls the plug. Candidate for Third Antichrist, Muhammad bin Salman, begins his Takeover of Saudi Arabia. Saudi War with Lebanon imminent. War with Iran with US and Israeli Help Next? 100 powers, thirst, famine, when the comet will pass. On 4 November 2017 (Saudi Arabian Time) a long-range Burkan 2-H ballistic missile was fired out of Yemen just minutes after 8 pm. 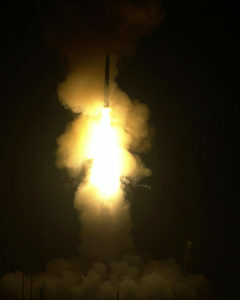 A few minutes later in the Saudi Arabian capital of Riyadh, 800 kilometers away, air alert alarms sounded and the launch of US-manufactured Patriot anti-ballistic missiles lit up the evening sky. There was a loud aerial explosion. Saudi military sources said the offending missile was hit and its broken remains harmlessly fell east of the King Khalid International Airport with no reported casualties. From a prophetic angle, we have here a possible action, a missile falling out of the sky on the Saudi capital, an event perhaps foreseen by a man from the pre-industrial mid-sixteenth century. He might therefore describe a rocket in his vision of a fantastic weapon from the future appearing in the night sky like a flaming tail, of a “comet” passing or running across the sky to its target. This “comet” on a flaming run to Riyadh may mark a significant, even history-altering action, setting into motion reactions that will affect everyone reading this—everyone in the world—in the weeks or months to follow. This may be the first “comet”-like shot of what would be, and what Nostradamus may have foretold, is the greatest war the Middle East has ever suffered. This could be the war to end all wars in the so-called Holy Land behaving, as usual, most unholy: a region-wide conflagration of war that might attract like moths to the fire the United States and the Russian Federation into a nuclear crisis because of a new contest between America’s unruly Sunni Muslim and Russia’s Shia Muslim vassals. A young dark man filled with evildoing. I have been warning you of late about a new candidate for Nostradamus’ third and final Antichrist. He may become the most formidable and dangerous of them all, because, unlike the other’s who have had their Arabic names easily convert by laws of Nostradamian anagram to the prophet’s code name Mabus, this one is not fighting the United States. He is Washington’s most significant Arab vassal and ally. He is a young man of 32 years that Washington has and will go on “absolving” for his many crimes, such as aiding and abetting terrorist factions in the Free Syrian Army during a bloody six-year civil war, and the systematic devastation of Yemen now approaching mass genocide. 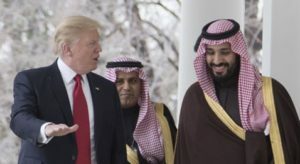 He is absolved of these outrages, including even his secret financial and armed support of al-Qaeda, because his kingdom sits on the oil the US needs to keep its hegemonic military running. He’s absolved because he’s the most powerful Sunni leader in the world that both the US and Israel support in their proxy wars against the supreme leader Ayatollah Khamenei of Iran. Khamenei is the most powerful political world leader of the minority Shia Muslim sect predominant in the Persian population of Iran, a regional superpower contesting Saudi Arabian regional hegemony. Khamenei’s allies are fellow Shia Arab vassals in the Middle East, such as those running the al-Assad Syrian regime and Cleric Nasrallah’s Hezbollah in Southern Lebanon. 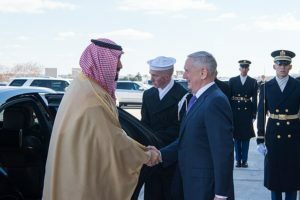 The “absolved” young dark man America and Israel support against the above is the Saudi current Crown Prince and soon-to-be future King. He is the infernal darling of US military industrial complex, its number one purchaser of US arms, Crown Prince Muhammad bin Salman. 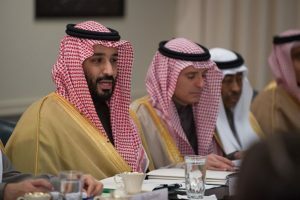 Following the Yemeni missile strike on Riyadh—or, “the comet passing”— Muhammad bin Salman (we’ll abbreviate his name to MBS for the rest of the article) has spent the week following the attack making decisive domestic and foreign political moves. These are bringing clarity into my Oracle’s focus about the shape of the great Middle Eastern war to come—the potentially apocalyptic conflict I’ve been warning would proceed soon after the defeat and destruction of the Islamic State in Syria and Iraq. Last Sunday, the morning after the 4 November missile strike on Riyadh’s International Airport, TV Ekhbariya reported that the deputy governor of Saudi Arabia’s southern Asir province and several colleagues died in a helicopter crash while they were taking a tour of an area near the coast in Asir, close to the Yemeni frontier. At first it looked like an accident, but in the following days of MBA’s sweeping purge of rivals to the throne, the deaths by copter crash took on a more sinister possibility. Mass arrests of businessmen and members of royal family ensued, ostensibly as the Crown Prince’s next step in a crackdown to eradicate rampant corruption—along with any significant figures who might contend his ascent to the throne once his ailing father dies and soon. A number of senior ministers and nearly a dozen princes were “detained” for interrogation by MBA’s new “anti-corruption committee.” The luminaries are telling. They include the leading member of the late founder of al-Qaeda’s family, Bakr bin Ladin, owner of the Binladen construction group with a net worth of $7 billion; Waleed al-Ibrahim, owner of the MBC Media Company (net worth $6 billion); Saud al-Dawish, former CEO of Saudi Telecom; Saud al-Tobaishi, Head of Royal Ceremonies and Protocols. The anti-corruption witch-hunt dragged into interrogation the Minister of Finance, Ibrahim al-Assaf, worth $390 million. After the BinLaden Group, the committee put under investigation a further three family heads of powerful Saudi family-run businesses and some more high cabinet officials, such as Adel Faqih, the Minister of Economy and Planning, Kaled al-Towaijri, former Chief of the Royal Court. Al-Towaijri had already been summarily dismissed when the previous King Abdullah had died, succeeded by King Salman and his son, the real power behind the throne. I imagine many of these people will find themselves under house arrest and soon. They will be stripped of their holdings and wealth such as the designated Crown Prince Muhammad bin Nayef, whom MBA removed to clear the way for his own succession in July 2017 along with al Waleed bin Talal. Talal with a net worth of 16.8 billion was one of Saudi Arabia’s most influential international media shareholding billionaires with a large stake in Twitter, 21st Century Fox, NewsCorp and Cititgroup. Locked away in the gilded cage of luxury of their own palaces under guard since July is the former Governor of Riyadh Turki bin Abdullah, along with fired Minister of the National Guard, Mitaab bin Abdullah and Turki bin Nasser, the former Head of the Saudi Air Force. I mean is it just me or is this much more than a sweeping up of the corrupt Saudi elites? Please donate $5.00 or a little more HERE, put Watch in the PayPal memo line. When I see your donation confirmed I will manually send you a fully illustrated PDF file attached to the email address you have used, entitled, The “WATCH” Article Thread—PART TWO. It will include the dramatic conclusion of the second article and explore further articles about how UFO’s may at last come out in the clear. There’s also the second part of the serialized edition of What “REALLY” Happened to Hillary Clinton, plus an important update on the Fukushima Nuclear disaster that could affect everyone living around the Northern Pacific coastlines. Here are the titles of the additional articles. 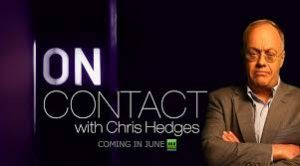 Hogue’s Alien Contact prediction for Mid-to-Late 2010s: Have Scientist’s picked up an ET Signal from a nearby Star? The Fukushima “Flood” of Radioactive Water—Is what Hogue Foresaw in 2014 Imminent? Thanks for your donation. It keeps Hogueprophecy.com thriving as your unique, online, prophecy news agency that explains current events matching future trends in these intensifying times.